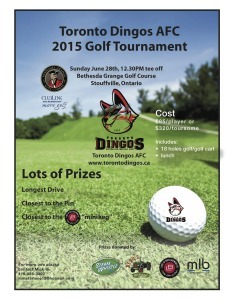 With the nice weather well and truly upon us, the time for the other sport obsession of the Toronto Dingos as come at last. The Red and Black will be hosting the Toronto Dingos AFC 2015 Golf Tournament on Sunday, June 28th at the Bethesda Grange Golf Course in Stouffville, Ontario. A club tradition for years, the tournament will feature a Longest Drive, Closest to the Pin and the classic Closest to the Mini-Keg competitions during the course of the 18-holes. The winner will choose from variety of prizes generously donated by a number of sponsors, including Steamwhistle Brewery, Beau's Brewing Company, Lake of Bays Brewing Company, and MLB Print Management. Cost this year is $85 per person, or $320 for a foursome. For more information, please get in contact with Mick McFarlane at mmcfarlane12@hotmail.com.